Catholics worship the Father the Son and the Holy Spirit. They honor the Virgin Mary and the Saints. As the Mother of God, the Virgin Mary has a unique position among the saints, indeed, among all creatures. She is exalted, yet still one of us. The Church honors her as the Mother of God, looks to her as a model of perfect discipleship and asks for her prayers to God on our behalf. Mary embraces God's will and freely chooses to cooperate with God's grace, thereby fulfilling a crucial role in God's plan of salvation. Throughout the centuries, the Church has turned to the Blessed Virgin in order to come closer to Christ. There are marvelous devotional practices whereby honor and veneration is paid by Catholics to our Mother Mary and our elder brothers and sisters, the Catholic saints. But the greatest honor we can given them is to study and ultimately imitate their inspiring example. Many of the saints of the Catholic Church have left us writings that can mark out the way to holiness and urge us on as we travel that difficult road. “Behold, your mother,” Jesus tells his disciple from the cross (John 19:27) is a message of Jesus to each member of his Church: Behold your mother, the one who brings God’s life to you. and go in haste to give him to others. when we pray the words of the Angel Gabriel in Luke's gospel, "Hail Mary, full of grace"? The appearance of Our Lady of Guadalupe to the Aztec Indian Juan Diego in December of 1531 generated the conversion of Mexico, Central and South America to Catholicism. appreciate the Gospel we bring, we must be aware of their life's circumstances and the culture in which they live their life. By understanding them, we can help them to understand and know Christ. In 1858, Mary appeared in Lourdes, France, to a girl named Bernadette. On March 25th, she asked, “Would you be so kind as to tell me who you are?" 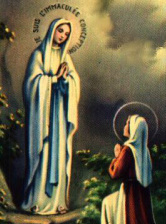 states that, “The Blessed Virgin Mary, in the first instance of her conception, by a singular privilege and grace granted by God, in view of the merits of Jesus Christ, the Savior of the human race, was preserved exempt from all stain of original sin.” Original sin was not removed from her soul as happens with baptism, but, in fact, was never even present there to be removed. "I believe in the communion of saints." As people gather in the Los Angeles Cathedral, they are surrounded by large tapestries of Saints, females and males of all ages, races, occupations and vocations the world over, from the 1st century to the 20th century. St. Paul teaches that, as Christians, we are one body in Christ. He taught that all members are needed and are to help one another. Belonging to the Body of Christ and the need to help one another does not end at our death. As these passages show, the early Church Fathers clearly recognized the Biblical teaching that those in Heaven can and do intercede for us. "Will you pray for me?" we ask of family and friends. Praying with the Saints is the same. We all pray to Jesus, but with each other. As we pray, we are drawn closer to Jesus and to each other, becoming one in heart and mind. 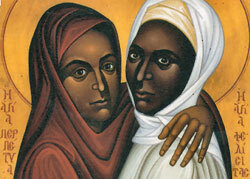 Augustine, in the 4th century, speaking at the celebration of the feast of Perpetua and Felicity, declared: " Let it not seem a small thing to us that we are members of the same body as these. We marvel with them and they have compassion on us. We rejoice with them, they pray for us. We all serve one Lord, follow one master, and attend one king. We are joined to one head, journey to one Jerusalem, follow after one love, and embrace one unity." The incorruptibility of the Saints is a miraculous phenomenon whereby the human body is not subjected to the natural process of decomposition after death, and is suspended from decay either temporarily or permanently through the Divine Will of God. This condition is not dependent upon the manner of burial, the temperature and place of burial or entombment, or any other external influence including embalmment or other preservation methods. There are currently several hundred documented cases of incorruptible persons in the Catholic church, many of which (but certainly not all) are canonized Saints or Blesseds.